i know i’ve been dropping hints for a while that i’m working on my first sweater. i haven’t blogged because the back of a sweater isn’t all that exciting. now the front left – which is what this picture is of – that’s where it’s at ;) really though, bits and pieces just aren’t that blog worthy, so this is all you get until we almost reach the end. pattern: drops cardigan that i first fell in love with here, ravelry link here. i’m making the lighter weight. 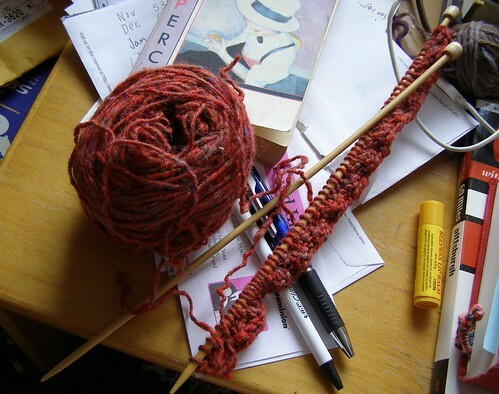 yarn: tahki tweedy alpaca – from my enabler flo. size: i’m making the medium. we’ll see how that goes. i put the back up to a sweater i like and it looks fine. what was your first sweater and how did it turn out (links would be good!)? i must admit to having one languishing from very very early knitting days… a cardigan in lamb’s pride bulky from when i had no idea what i was doing. it needs to be 1) ripped and 2) dyed some color other than carnation pink. have a great day! it’s sunny and cold here in pgh and i’m planning to get outside for a walk. This entry was posted in knitting, sweaters by cosymakes. Bookmark the permalink. my first sweater was a green baby sweater. i wanted to practice on something smaller so i could get the idea. i made mistakes, would go back and fix them. when it came time to stitching the peices together, well, it was little difficult. just make sure to block the peices before you stitch them together. i have the story in my blog. good luck and enjoy! It’s very fortuitous that you posted this today. My first sweater was the Hourglass from LMKG, which I happen to be wearing today. Today is also the one year anniversary of my blog, which debuted with my FO post (http://muchadored.wordpress.com/category/hourglass/) for the Hourglass. I used a cheapo blend yarn and the neckline is sort of weird, but I still get a ton of use out of it. Ooh, that color is amazing! I always underestimate red-oranges and assume I won’t like any of them. My first sweater was a top-down raglan a la Stefanie Japel at glampyreknits.com. She has basic instructions in the “free stuff” section of her shop. I used Lion Brand wool in a pretty burgundy color, and it turned out quite well. My sewing skills stink, so top-down and in the round seemed like the way to go. This is still my “go to” sweater method, and I’ve yet to make one any other way. Maybe one of these days I’ll get brave and knit in pieces! My first sweater was one I knit a few months after I really learned how to knit. However, the pattern did not have a big enough size for me, so I was morphing the pattern as I went, at a time before I had any clue how patterns and sizing and such worked. It was pretty funny, actually, I was so confident, throwing caution to the wind. It was a raglan cardigan…it turned out huge and ill-fitting, and I don’t know that I ever wore it more than around the house, but I still have it and I smile when I see it to realize how far I’ve come. :) I keep thinking I’ll rip it one day and reuse the yarn for something that actually fits, but so far I haven’t felt that compelled to do so. My first sweater was a stripey number that turned out way bigger and boxier than I expected, partly because I was using cheapo acrylic yarn. I can’t wait to see your finished product. I just finished that DROPS cardigan (with major changes, to make it seamless, and a little more a-line in shape so it can double as maternity wear in the future) out of a three-ply handspun I’ve been working on for ages. I made the bulky version, and I adore it. The one addition that was not knitting-related, and that I am suggesting to others is that I sewed tiny little buttons on the inside of the front placket, so that I could slide them directly into the knit stitches of the inside placket, and hold it in place better, that way–kind of like the inside buttons on a double-breasted coat.